Rain's Garden: Some Cheese Updates! 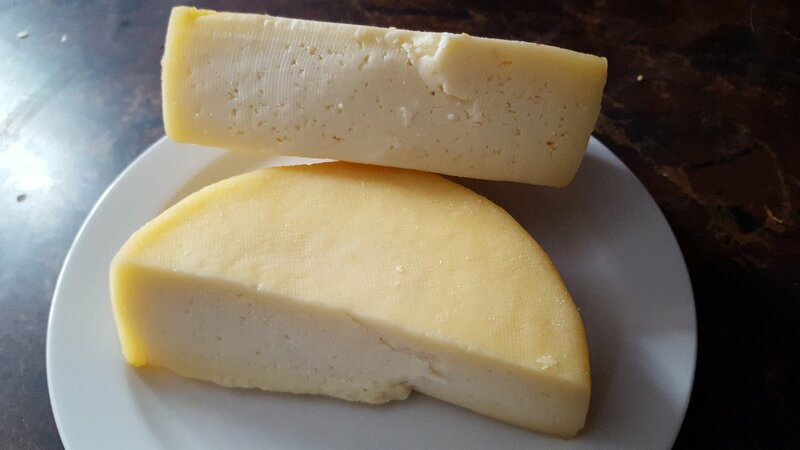 We opened our 3-month aged Cheddar the other day! I made this cheese way back in July and it was time to try it! 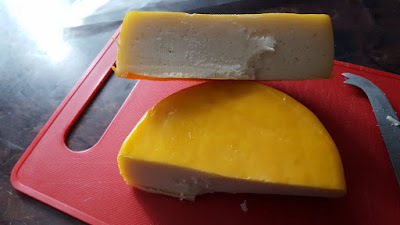 I wrote a more detailed post on Rainy Day Cheese Making, but in a nutshell...that icky orange plastic coating left an unnatural taste on my lovely little wheel. We cut the outer rind off and it's now "airing out" so hopefully in a few days we won't taste that plastic anymore. Otherwise, the cheese was very tasty! I'm confident to make more but definitely NOT with the orange coating! 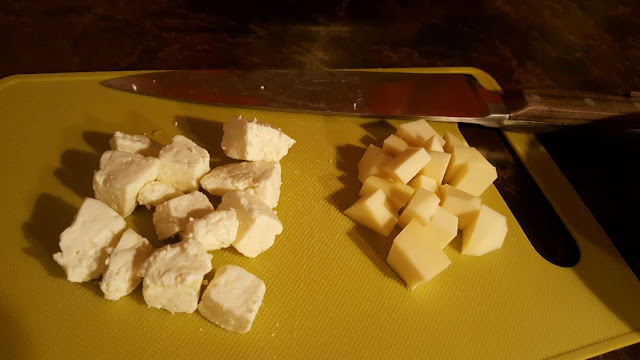 This isn't my cheese...this is a photo I got from the internet of factory-made curd cheese for poutines. This consistency is smooth and slightly rubbery, which is spot on for a poutine curd. The cheese on the left of the cutting board is my fresh curd - which is very nice tasting, but by no means a poutine curd! I personally do not understand how the factories make their cheese so perfectly without aging it. From my little experience, I know that fresh cheese is soft and more like a Feta consistency at first unless you start to age it. 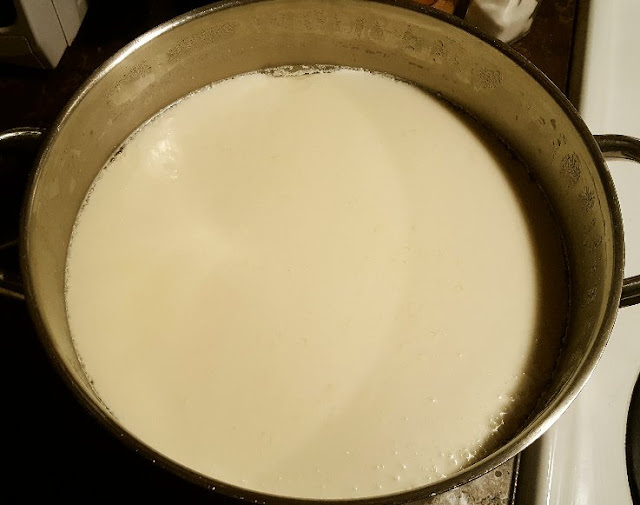 Curd isn't supposed to be aged...I've tried 7 different recipes for curd cheese over the last few months and they never get to that same consistency as the ones I showed above. I kept asking myself WHY do people say that their recipes make "the perfect curd"? Anyway, I know when I'm licked! I won't be making curd anymore, but, the cheese on the right of the cutting board is my aged Mozzarella, we used that for the poutine instead. With a homemade gravy (that still isn't perfected! 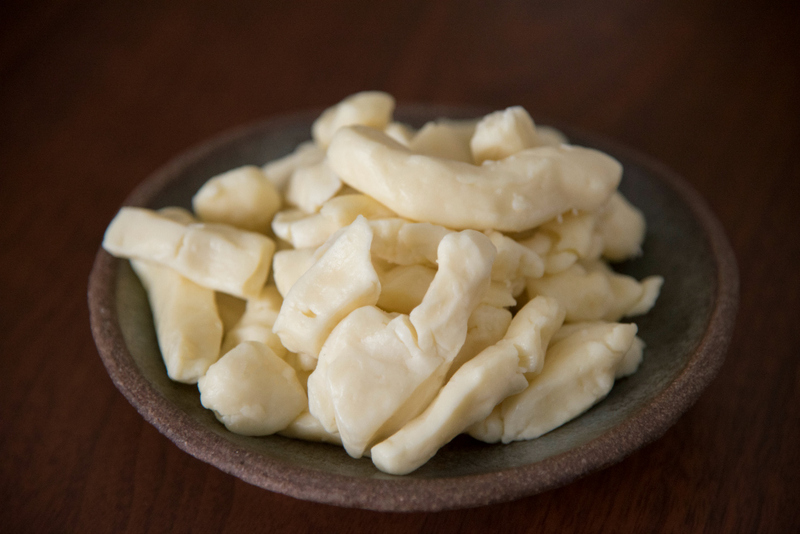 ), it made a great curd cheese substitute and that's what we'll be using from now on. I took this photo too fast because I wanted to eat my chicken burger lol...but the cheese actually did melt under the heat of the gravy! I am currently in the process of making my first cream cheese! I want to make a pumpkin cheesecake for Halloween tomorrow and decided NO MORE STORE BOUGHT!!! It's currently in the draining phase and I'll post an update on Wednesday! So far though it smells and looks right! But my gosh...there is SO MUCH of it lol...I must get some bagels!! Oscar silliness. 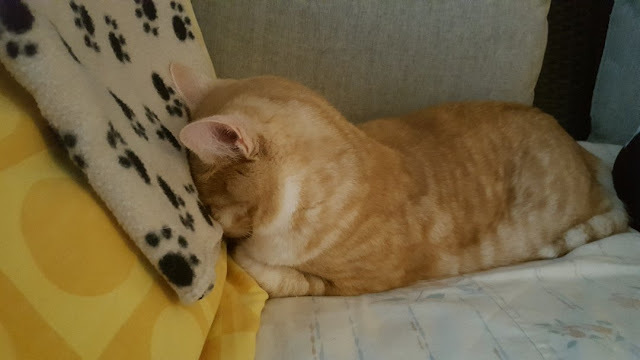 He's been sleeping with his head face-first against the pillow lately. It's very cute! Our pets are always entertaining to watch! We are in the middle of a nasty Nor'easter and the wind is shaking the cottage, at least that's how it feels! We've had power loss off and on all night...I'm hoping it'll all settle down soon, it's too dangerous to walk the dogs in the woods during wind storms. Homemade cream cheese is so good. I used to make it when we had the goats. Yum. That cat photo is so funny! Cute. Though I have no personal knowledge, I'm sure there's a steep learning curve in the art of cheesemaking. You're very good at sticking with it, but also know when to throw in the towel (cheesecloth?)! Yay for your returning energy!! i am in awe of all the big projects you take on. 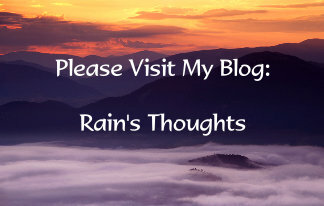 I have a few on my list for today, but will probably put them off till tomorrow. I wish I had your enthusiasm and energy. I love that cat photo. To curd or not to curd!?! :) If it doesn't work out, there is more cheeses out there to try. Let me know how the cream cheese goes, I am thinking that will be another that I'd like to try to make. You should make some bagels to go with it once the cream cheese is done for the cheesecake. Mmmmm. Bagels. OMG Oscar!! I have a female ginger cat called Sage - she's currently living with my son as she was being bullied incessantly from our other two cats. She's such a gentle soul. I miss her but do get to see her regularly. Ginger cats have a very unique personality. poutine.....the thing dreams are made of! you should make my vegetable gravy. it is excellent on poutine. i've only made a few cheeses in all my years. not sure why i never got into it much. when i was heavily into my indian cooking phase, i made paneer all the time. a nor'easterner! i wish i was there. i love winter storms! That must taste great and so nice that you made it yourself. Lovely cat. Greetings! Your cheese looks so good, if it smells like plastic then it could pass for government cheese. Anyway you have made me hungry again just looking at it. That home made cheese sure looks good. We buy all our cheese, as we have never learned to make it. I wish we could make cheese, soap, and do canning. About two years ago we tried canning but never followed up with it. I did learn to make candles, though. Like you with your cheese, it was a step by step learning experience. We had terrible wind and rain Saturday and Sunday here. This morning I went out and picked up as much of the branches that fell from trees as I could. Last night a big tree came down in the forest, but I haven't been out to look for it yet. I like that cat. Even when cats are naughty, they're still good to have around the house. Nice to catch up with you, yes, summer's gone. Must've been rewarding after a 3 month wait for that cheese, glad it tasted good. Making your own cheese seems like such an accomplishment to me. If I made only one cheese in my entire life I'd feel mighty proud! HAHA So you should definitely be thrilled at your progress. I'm really enjoying watching how it's all coming along for you. And homemade cream cheese! That is the ultimate. Definitely time for you to get some bagels. We are due to pick some up soon in Montreal. It'll encourage us to take a day trip. I laughed with Oscar! One of my cats does that sometimes and it's hilarious. So much fun at your place. Oscar and my Slimbie sleep the same way. Slimbie butts his head against my leg and, of course, I am then trapped in place for the duration of his nap. 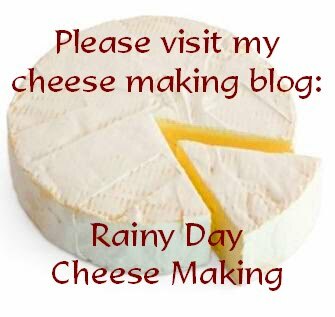 Your cheeses look great, Rain! We went through the Nor'easter Sunday afternoon, right through until Monday morning. Geezlouise. Lots of tree damage and almost three inches of rain. That kind of excitement I can skip. So sad about the plastic taste but I bet airing it out will cure it. Also, I too have tried recipes that say "The Best" of something or "You Won't believe how good this is" and they have been disappointing every time. No more Pinterest recipes for me! Only my friends recommended or All Recipes that are rated. At least you found your other cheese works. Your sandwiches always look SO good! I am not a good sandwich maker but when I see others they look delicious! Are their sandwich recipes? I am not a creative cook at all....I need a recipe every time! LOL! I wish we would get N'oreaster's....they sound like really cozy storms! I hear so little in this house as it is brick and very well insulated....dang....I like to hear my storms! I don't want people to get hurt or property damage but I really do like a good storm when I'm not out in it. 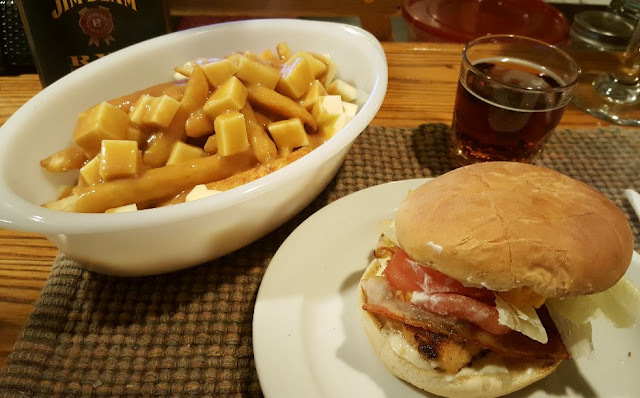 Yummm...poutine. hope your cheeze airs out well. I've never had cheese curds. I know they're popular in the midwest? The texture of your whole cheeses look great. Thank you for the sewing support. I think I can handle zippers for pouches and bags now. I sew slowly with the machine and I like how Dana made it look so easy and made it easy to follow her tutorial.